Budweiser just released news about their newest addition to its Reserve Collection – Budweiser Freedom Reserve Red Lager. The new beer was specially brewed by Budweiser’s own veterans and builds on Budweiser’s long-standing support of American veterans with a portion of proceeds sold this summer benefiting Folds of Honor — a nonprofit organization providing educational scholarships to military families. As of this year, the company has raised $14 Million in support of Folds of Honor. 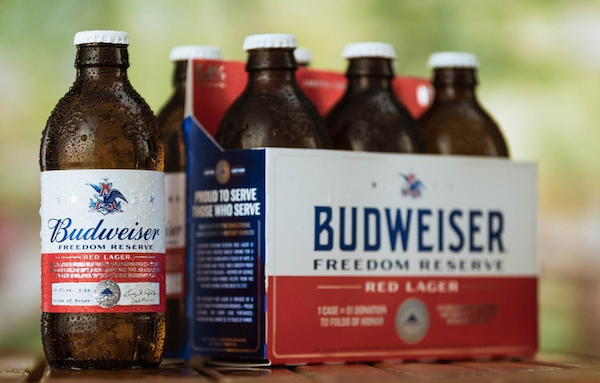 Budweiser Freedom Reserve was specially brewed by Budweiser’s own veterans and a portion of proceeds sold this summer will benefit Folds of Honor. Budweiser Freedom Reserve Red Lager is brewed with toasted barley grains for a slightly sweet aroma with a touch of hops, a rich caramel malt taste and a smooth finish with a hint of molasses. Print article This entry was posted by Art Eddy III on May 1, 2018 at 11:00 am, and is filed under Lifestyle. Follow any responses to this post through RSS 2.0. Both comments and pings are currently closed.